Chances are that you’ve had Buffalo Wings at one time or another. But unless you’ve been to Buffalo, New York, you haven’t had the real thing. 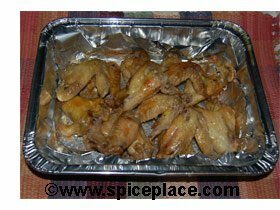 We have a genuine Buffalo Wing Recipe that we got from a small Buffalo Wing shop located in Buffalo, NY. And it’s a killer recipe. This isn’t a quick to make recipe, the Buffalo Wings need to marinate in the seasoning sauce for 4 hours before cooking. They’re also cooked at 500° F for an hour. Preparation time is about 20 minutes. 4 hours to marinate, and 1 hour to bake makes about 5 1/2 hours from start to finish. There is no rushing this recipe if you want your Buffalo Wings to taste good. If you follow our directions in the Recipe for Buffalo Wings, you will enjoy a delicious meal of Buffalo Wings. Use a blender to mix the seasonings. If you use the Tabasco Sauce, and the 1 1/2 tsp of Cayenne Pepper, you’ll have a mild flavored wing. Use more Cayenne for more heat in the Buffalo Wings. Our recommendation is to start with the middle of the road and use 1 1/2 tsp of Cayeene until you know if that’s too hot for you and your family, and then adjust the seasoning to your tastes for later recipes. We marinated the Chicken Wings in a large gallon sized ZipLoc® bag Turning it over ever 1/2 hour or 45 minutes. It’s easiest to use large 1/2 pan disposable pans lined with non-stick aluminum foil. Without the non-stick foil, the Buffalo Wings will stick to the pan. Only place the wings in the pan. Dispose of the sauce. The wings absorb the sauce, and you’ll see there is plenty of liquid at the end of cooking. Bake the wings covered for the first 45 minutes then remove the aluminum foil cover for the last 15 minutes to let the wings brown. 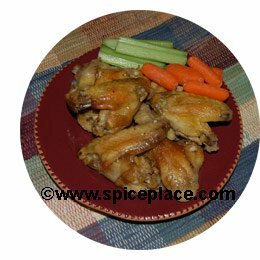 Serve with Blue Cheese Salad Dressing for dipping the wings, along with carrot sticks, celery sticks, and cucumber slices.